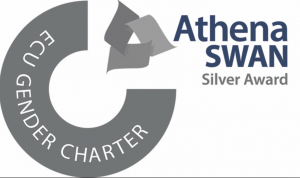 A few weeks ago, I was delighted to announce that the School of Biosciences had been awarded an Athena SWAN Silver award. This is a recognition of our efforts to address gender inequality in our workplace since 2014. Biosciences has been an Athena SWAN award holder continuously since 2007, having oscillated between Bronze and Silver throughout that time. Our achievement is something that we should not take for granted. Not only does it reflect some fantastic progress that we have made towards equality within the School over the last 4 years (and we still have a long, long way to go), it shows that we convinced a very critical panel to earn the award. I’ve seen a few myths about Athena SWAN panels recently; that they are composed only of ethnic minorities; that the white middle-aged men who have the most to learn never take part; and that it’s all some devious plot to impose a matriarchy. I’ve sat on quite a few now and so can quash all of those myths (not least the middle aged white man one). A panel always comprises five independent people, typically 2-3 academics and the remainder being professional services staff. They are a cross-section of university folk, so there are women and men of all ages, all races, with the only common strand being that they are usually from a similar discipline. Alongside these people the Equality Challenge Unit provide a note-taker and a moderator who ensures fair-play, consistency and keeps the panel aware of the criteria that need to be applied. The panels are no pushover. They will usually consider four applications which may be institutional or departmental, or both. In my experience very few will get the award that they applied for. Most Silver applications end up with a Bronze award. Some applications for Silver and Bronze come away with nothing at all. In fact 46% of Bronze applications receive no award and only 42% of Silver applications are successful. Silver awards need to show clear progress since the last application and to address all the criteria for a Bronze award- a full evaluation of data on staff and students, reflection on where issues with equality may lie and an Action Plan to address those issues. We did this! I am so proud of the recognition that our efforts have received. Over the coming weeks we will be posting more blogs which give an idea of what lies ahead of us. 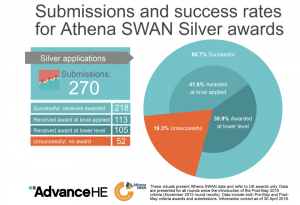 Athena SWAN awards are underpinned by an action plan which sets out a series of initiatives that are aimed towards further progress in achieving equality. If we are to sustain our Silver status will have to demonstrate some clear impact against the action plan. Everyone in the School will be involved one way or another and I hope that we will enjoy the journey! Thanks for the information about the issue. The School of Biosciences has set itself the challenge to be an outstanding place to work. Encapsulated in this vision is a commitment to provide a supportive environment that values equality of opportunity for all. This blog will give an overview of the work that we are doing to promote Equality, Diversity and Inclusion in the School.